Don't let this cold weather get you down. 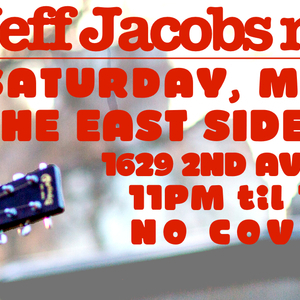 This Saturday, come sway along while Jeff И' Friendsickles tickle your sensickles at the lovely Eastside Cantina. The wonderfully talented Cassie Nadeau and Chris Savine will be sharing the stage for an intimate stripped-down acoustic set. As for me, the only thing stripped-down will be the top button of my vest, if mad-scientist/drummer virtuoso Brian Radock has anything to say about it!Drink specials, tasty tapas, laughs, tunes, and smiles all night. Your presence is the best present.